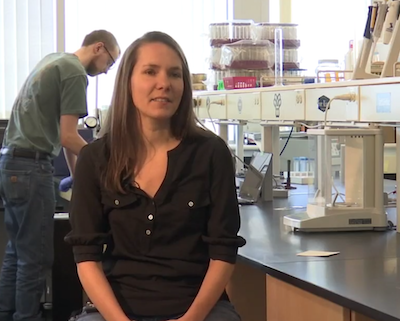 Luci Benedict, associate professor of Chemistry at the University of Southern Maine (USM) and director of the University’s Quality Control Collaboratory (QC2 lab), was recently featured in an extended WGME 13 news piece about Maine’s booming craft beer industry. In the June 2 special, “Maine on Tap,” Benedict spoke about the lab’s role in helping local brewers assess the taste and quality of their products — a challenge that began emerging for several beginning craft breweries. The QC2 lab, a partnership with the Maine Brewers’ Guild, provides testing, research and education to Maine breweries, and provide students with hands-on educational experience. Four years after its founding, the lab is showing no sign of slowing down. It’s no secret Maine has become a hub for craft beer, with breweries popping up across all 16 counties. According to the Maine Brewers' Guild, there 117 active breweries in the state as of this past April and, as of 2016, breweries added $228 million dollars to the state’s economy and an estimated 1,600 to 1,800 jobs — numbers that are expected to rise. The QC2 Lab is helping prepare the next generation of scientists to aid those brewers. USM junior Nicolas Mesloh spoke highly of his experience in the lab. "There was no turning back. Now I'm a yeast biologist," Mesloh said. And as Maine’s beer scene grows and evolves, Mesloh said quality control will only become more important. "Have a healthy respect for the brewers and the scientists who make sure your favorite beer stays your favorite beer and doesn't gradually morph into some abomination over time," he said.